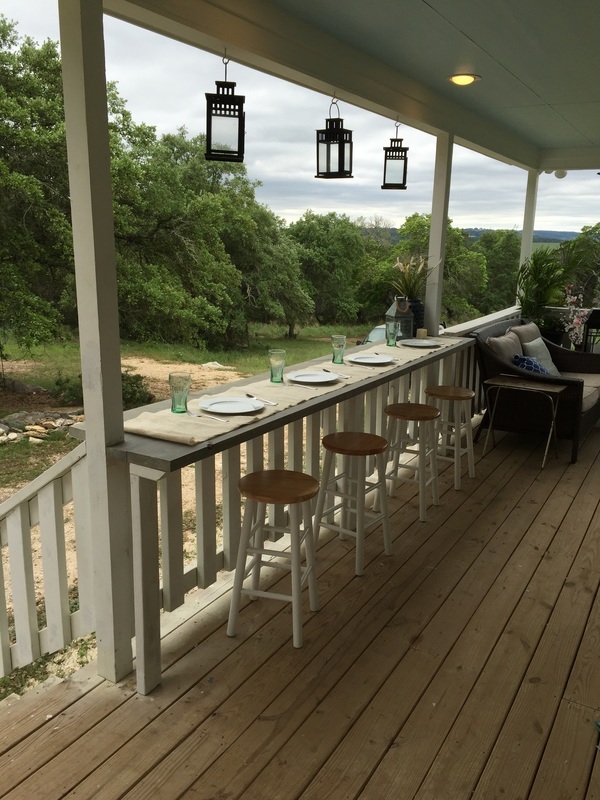 Eat-up bar from plain railing, "Rhyne Farm"
Hey y'all. 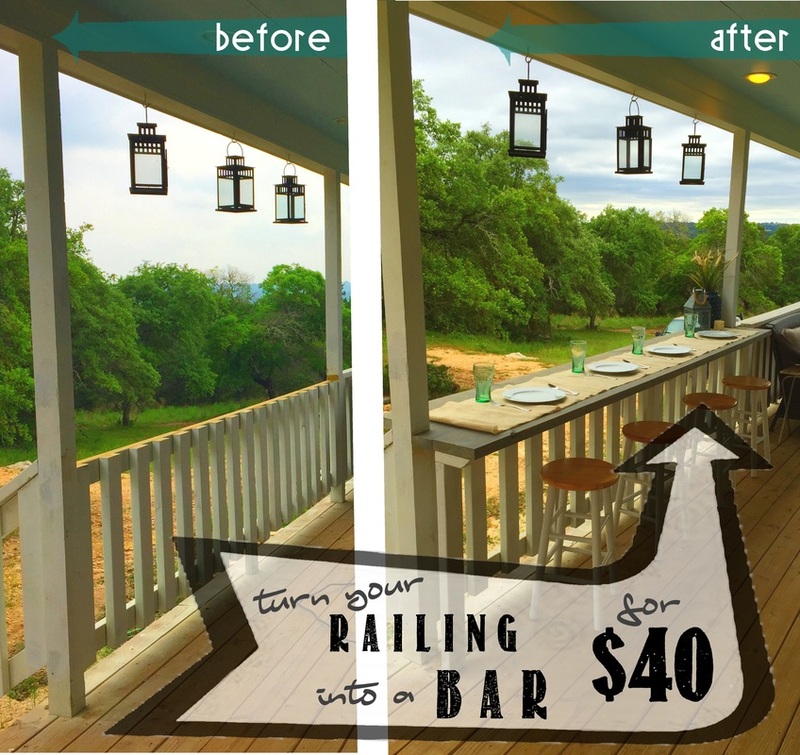 Just wanted to share this quick and easy project with you that will really "WOW" your guests and increase your seating capacity! Just outside our living room sliding glass door is 11 feet of lovely railing. I love the space, it looks right into the tree cove and outdoor kitchen. But it's really awkward and unusable space. The space is a little too narrow to put a table or even chairs because it is such a high traffic area. So, a narrow bar, that takes up about 24" of space is PERFECT. 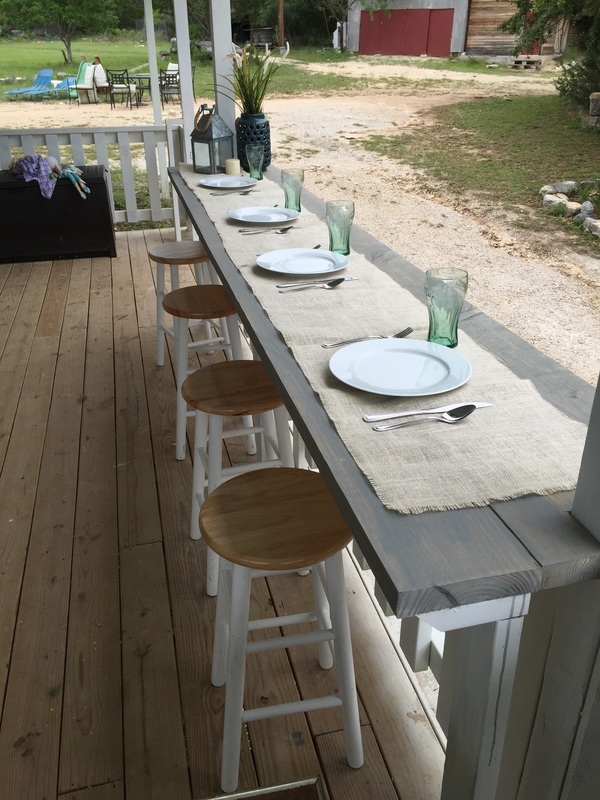 I also did this project at our last house (pic below) and loved it then, and knew I wanted to do the same thing here in Texas. This project took me about 3 hours to build, not counting painting... because it started to rain.. blah!! So lets dive in. It's really a simple project, once you get started. 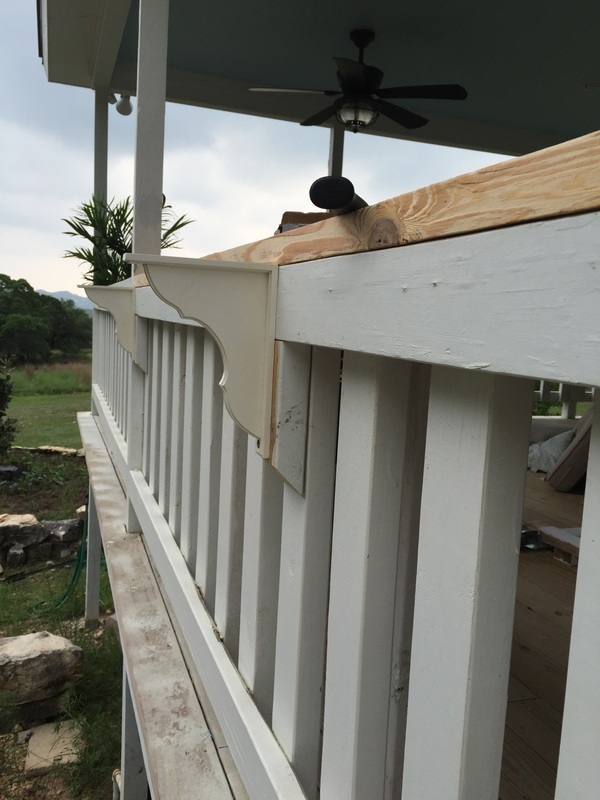 The way my railings were built, they had a flat 2x4 as the top "rail". It was nailed in with a gazillion huge framing nails, so after banging with a sledge hammer from underneath for about 20 minutes, I was finally able to remove the top rail... AND then I remembered to take the "BEFORE" picture. I just really like demolition, hehe. I wanted my bar to be flush with the other railings at 36" high, which also happens to be standard "Counter-height", so a counter-height stool would fit perfectly. The picture on the right is the "Bar Height" bar I build at the Enumclaw house, that is 42" high. You could build your bar and either height, just as easily, all preference. Eat Up bar at Enumclaw house at "Rhyne Farm"
So first thing first, MEASURE. My distance was 11'-0" from outside of 4x4 to outside of 4x4.. and 10'-8" inside the 4x4's. 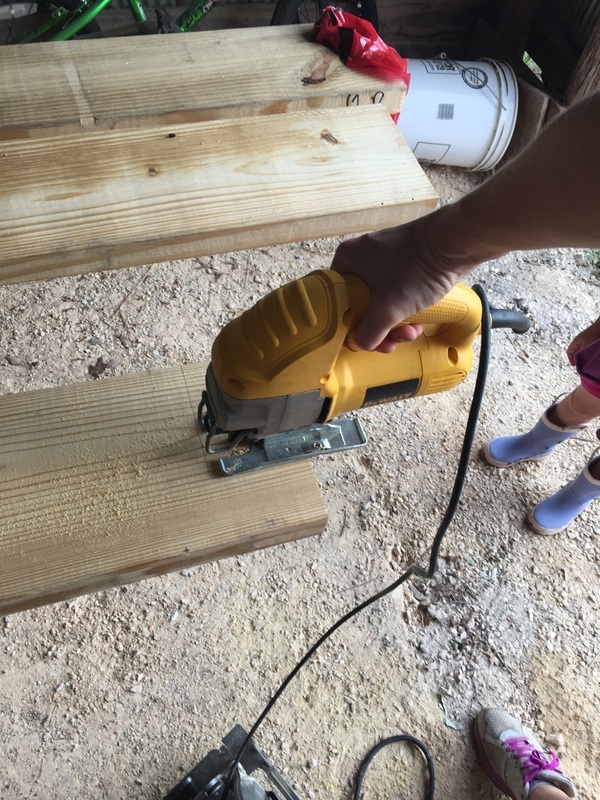 So started my cutting my first 12 foot 2x8 at 11'-0" with the circular saw, and cut out 3.5"x3.5" squares on either side for the posts with my jig saw. My three year old took this picture of me. Wasn't that nice of her. You can see her little boots in the jig saw shot. She left shortly because it was "Way too woud". So after I got the post cut-outs done, I connected the front two 2x8's with diagonal screws using my Kreg jig. This tool is necessary for almost everything. I use it all the time. I got mine at HERE: Home Depot for about $100 a couple years ago and it was worth every penny. 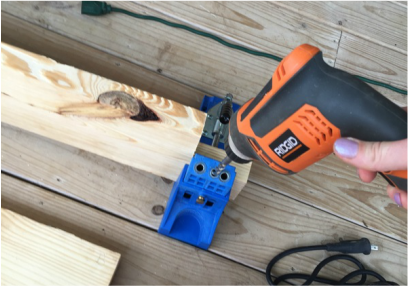 I pre-drilled holes, alternating on either side, about every foot, so it would hold strong. Now that the two boards have been joined together with 3" screws, I built the front supports out of 2x4's. Measure the height to under your bar, and subtract 1.5" for the little 6" horizontal support piece. Secure the small 2x4 horizontal support to the vertical 2x4 support with (2) 3" screws. Don't worry about painting or anything yet. 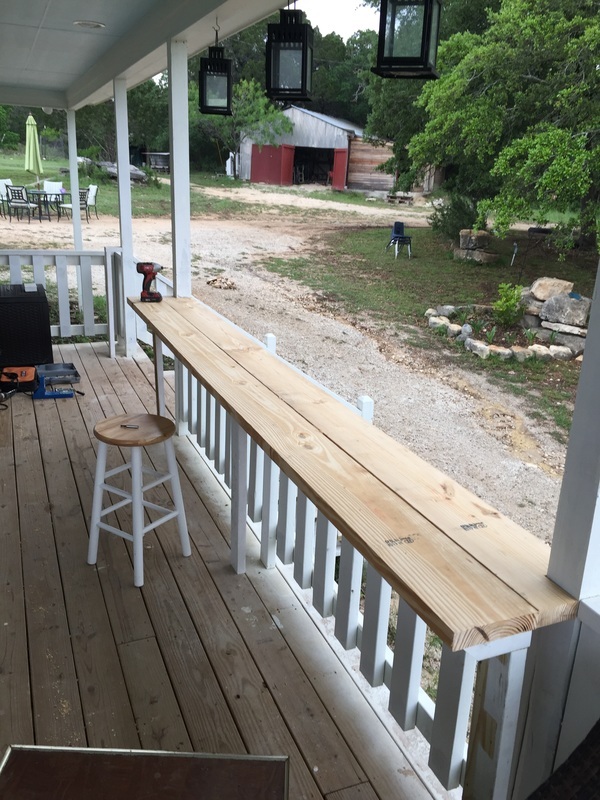 My support posts are white because they are salvaged from the top of the original railing that I ripped out moments ago to install the new bar. Salvage as much as you can. 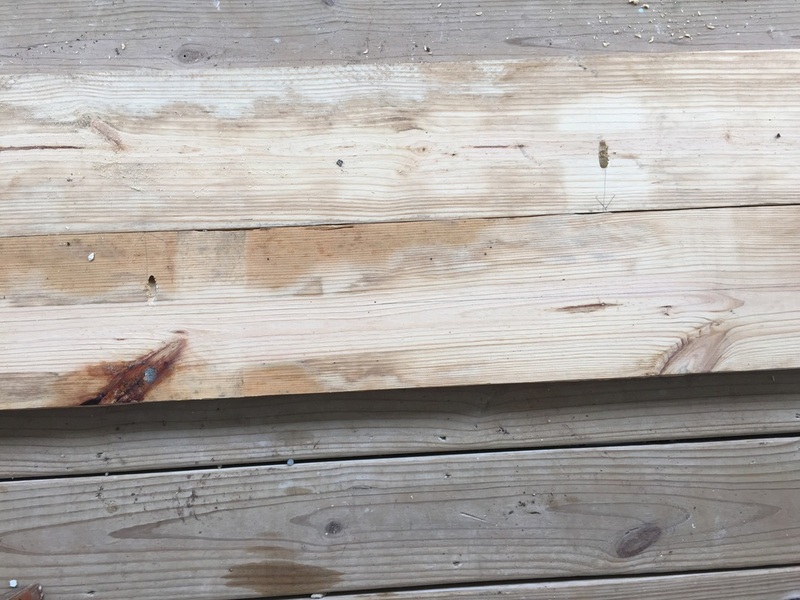 So, technically my project was about $30, because I had salvaged 2x4's and my mother-in-law gave me the support brackets, but we'll just assume you have no wood. Once you have your front supports built, you will need to secure them to the bottom of the front of the bar. I have a rolling baby gate going underneath my bar (we'll talk more about that later), so my supports needed to be 4" away from the back of the existing railing. I measured the bottom of the bar and screwed them in. So once you get your support posts secured to the bar, find a kid, or a spouse, or an in-law to help you flip it right side up, and slide it into place. Luckily, my hubby works in that window right there, 5' away from where I was building. That is his office. I could hear him making calls while I worked. I'm sure he appreciated the sound of the hammer drill and saw during those calls. (Yea, right)... but I snagged him long enough to help me get the front of the bar into position. You can kind of see the outdoor bar and fire-pit area, ignore the unfinished fireplace. I'll be working on that soon. 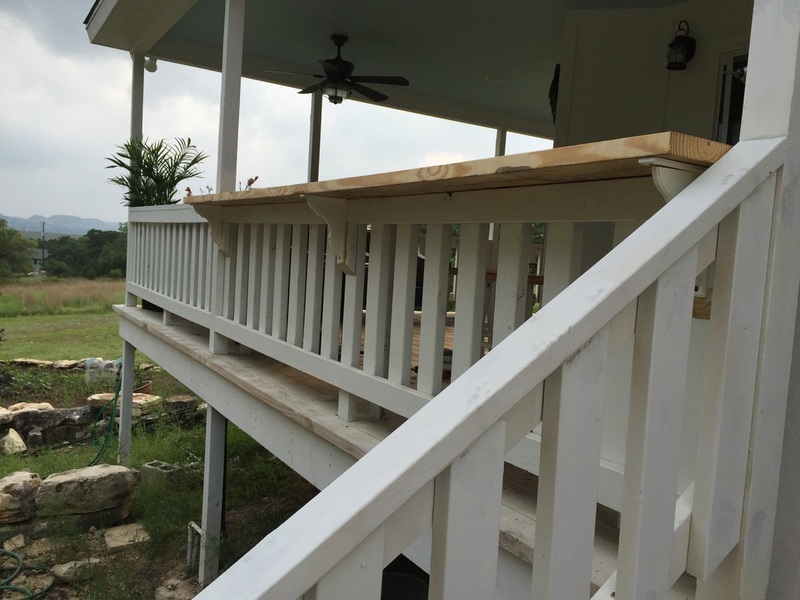 Once your bar is in place, screw the top down to the existing railing, near the outside edge. I attached it with 3" screws every 24". However, we are in Texas. We do big meals, with big mugs and LOTS of napkins, so I needed an extra 7.25". 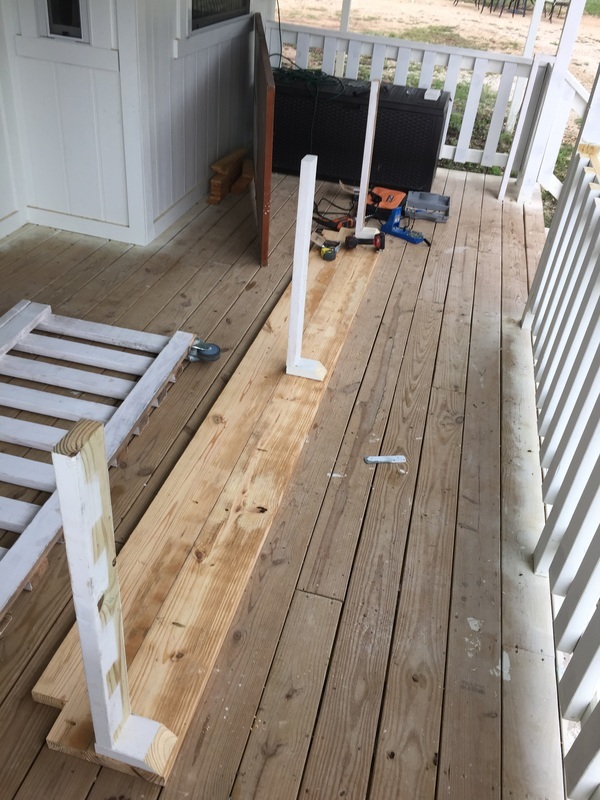 I didn't want to intrude on the walking space anymore, and there was no more need for leg room, so I installed the last 2x8 out the back. I decided that I wanted my brackets to line up with the vertical supports, so I marked each one. Based on how my railings were built, I needed to build a quick support piece for behind the brackets at the bottom to make them flush, using scrap 2x4. I secured both with 3" screws. Once those were up, I could start on the last 2x8 for the top. Now that your last 2x8 is secure, you are ready to paint. Wait til the rain stops, can you see the storm coming my way? We got like 3" of rain that night, it was crazy. I pre-drilled my kreg holes, so I could secure this bar piece to the back of the existing center bar top. I drilled holes every 18-24". Then I put the bar top on the brackets, make sure your kreg holes are facing the existing top. Then I screwed in the last piece to the existing top with 3" screws. Once I that was secure, I attached the brackets to the bottom of the back of the bar using 1" screws. Do NOT use 3" screws to secure the bracket into a 1.5" piece of wood. You will have screws sticking up out from the bar. I'm told guests frown on this. And there ya' have it. Hang some lanterns over the space to make it more welcoming, pull up some stools, and you are ready to go. My 11 foot bar comfortably fit (6) stools at our last party. Hope y'all come back again for more home improvement ideas. Well, if you know me at all, you know I am nothing, if not real. 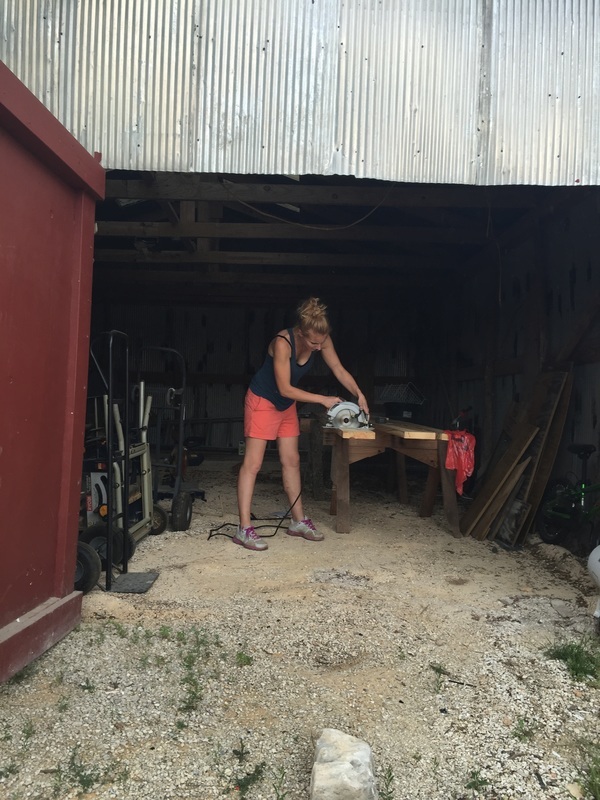 So to bring some reality to the WIWW situation, I give you WIWW: Farming Homeschooling SAHM edition. Feel free to post YOUR OWN awesomeness in the comments!! Maybe soon we'll start our own link party!! I had to mow the lawn today so this is the outfit I came up with. Don't you just love it, LOL. We have 14 acres, and although I only mow about 1.5 acres of it, with a little 22" mower, it takes me 3 hours. And when you are spending 3 hours doing something, it's really important to dress for the occasion. I got the blue tank at Walmart, pink sports bra at Target, and the black capri pants at the Dollar Store, for real!! My make-up is left over from yesterday. I went grocery shopping yesterday... and usually do on Tuesdays, I wear cute clothes on Tuesdays, maybe I should make my own WIWT... or What I Wore Sunday would work much better for me. Anyway, my hair is styled in my traditional style, the messy bun. Isn't it darling? If you were to look closer, there are quite a few twigs stuck in my hair from mowing under the trees, and trimming a few of the dead oak branches. This is life on the farm... ain't it grande? I need to go shower now. So, we moved into this house a little less than a year ago. 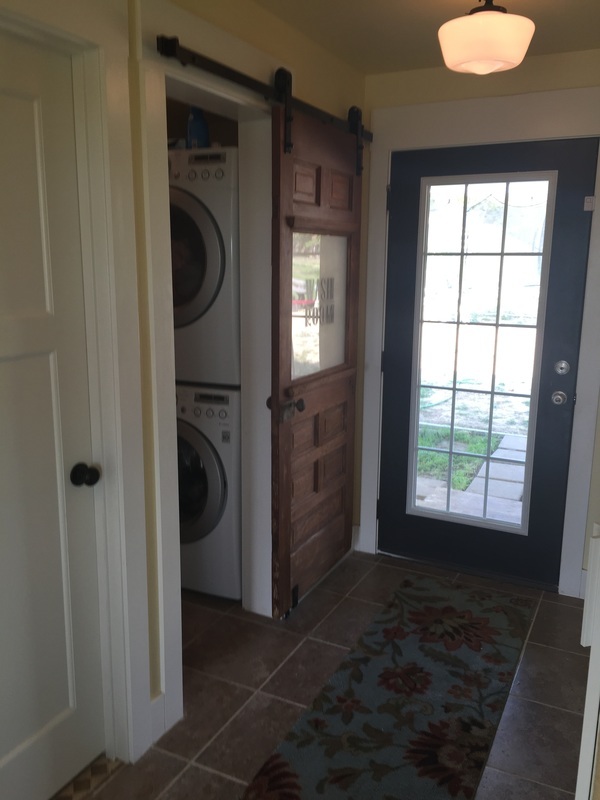 Our laundry room door, that is also the powder room/ guest bath has been without a door for 7+ months. Ok, well, we put up a curtain but if you really had to go, you had to use the master bath, which meant any and every guest was walking through our master bedroom, so it had to be clean at all times!! Gah. Well, the reason the door took so long was because I bought this antique door a year ago... and it sat in our barn. 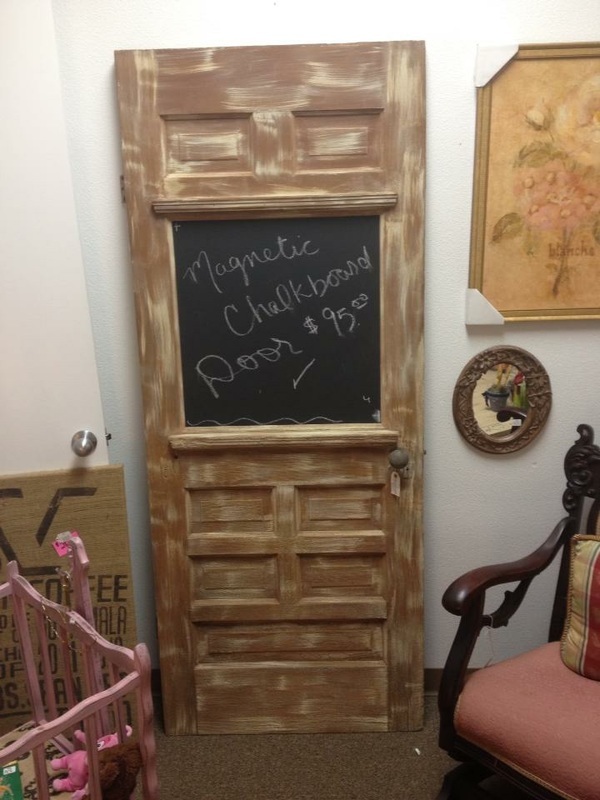 The door was painted brown, then someone took a white brush and tried to "shabby chic" it. Now, don't get me wrong, I love shabby chic, but not when it looks horrible. So, I removed the chalk board and stripped all the paint. I live in Texas. I don't like long pants all that much, but trust me when I tell you, WEAR PANTS. I got some paint stripper on my leg and it BURNS, burns bad. This coming from a woman who had 4 children withOUT any medication. I sprinted to the hose and completely soaked my leg, shoes and everything around me.. DANG. Anyway, it took me a couple days to get the door completely stripped. With 4 kids, the only time I have to do projects is after they go to sleep. 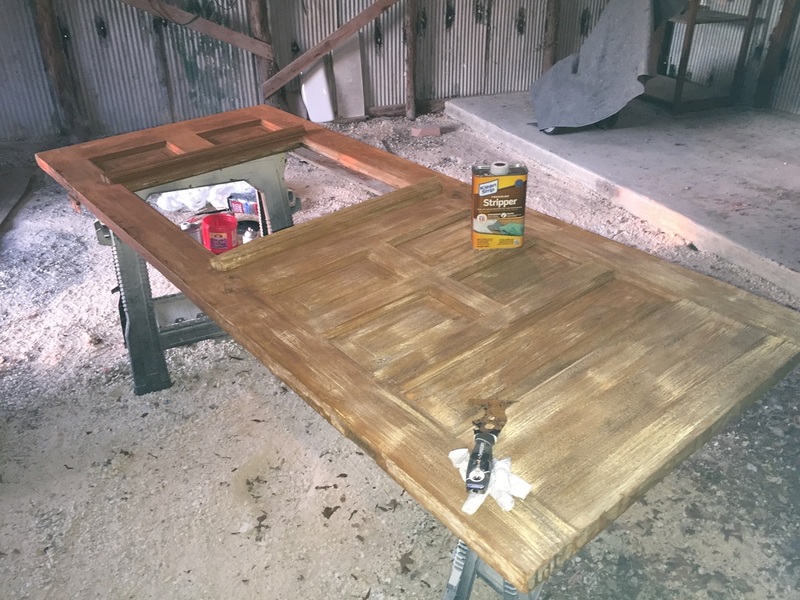 But once I got it stripped, and washed, I applied a coat of 1 part Dark Raw Tung Oil, 1 part Citrus Solvant to achieve the color that the door might have been, back 80 years ago. It took a couple days for the tung oil to dry... about 3 days, but it continued to stink for about a week. I cut to size, two sheets of plexiglass, sprayed "frosted glass" on one side of each. (sorry I prepared the glass shortly after I bought the door, so I forgot to take pictures). But once one side was frosted, I put the two frosted sides together so the "frost" couldn't scrap off, then installed them in the door, and put trim around. I bought a customized vinyl letter sheet, with "WASH ROOM". And installed it on the glass. I bought the barn track from Home Depot and LOVE how easy it was to install. I did have to cut some of the track off because our space was so tight but it worked out perfect. I love how it has adjustable bumpers, so it will stop exactly where I want it too. This was very important because the antique door knob now stops 1/8" away from the interior door jamb, without ruining my white trim. I am thrilled with how it turned out and it slides beautifully. With the bumpers, the kids can't slam it, and the track keeps it from swinging out or in. When you live in a new house, you have to add some charm. I can't handle too many new things, actually if I could have all old things, that would be spectacular!! And there ya have it!! Linking up with Songbirds Vintage Inspired Post! <<--And this is our house from the back. When I originally designed the addition, I thought this would work as the "carport", then eventually turn into a patio once we put the pool in. But that did not happen, with the kids playing back here, it turned into our main access point, and when it rained, it was MUD city. And if you are familiar with the south, it's CLAY, and once it's on your shoes, it takes a chisel to get it off. So, knowing I eventually wanted a brick paver patio back here, I decided to put a "gravel/ dust base" down to make it more usable. It's so much better. 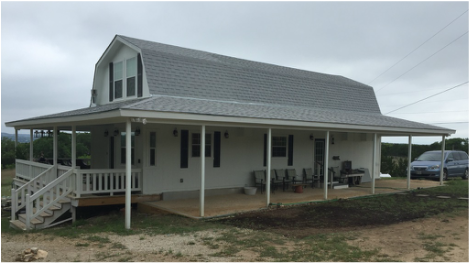 I didn't extend the gravel all the way to the edge of the porch because I plan on building a giant sand box right there for the kids.... one day. Last Christmas, when my family was here visiting, my dad build us these stairs (lower left pic) . It was only a 9" step, so we just stacked a couple of pavers, called it a stair, and called it good. 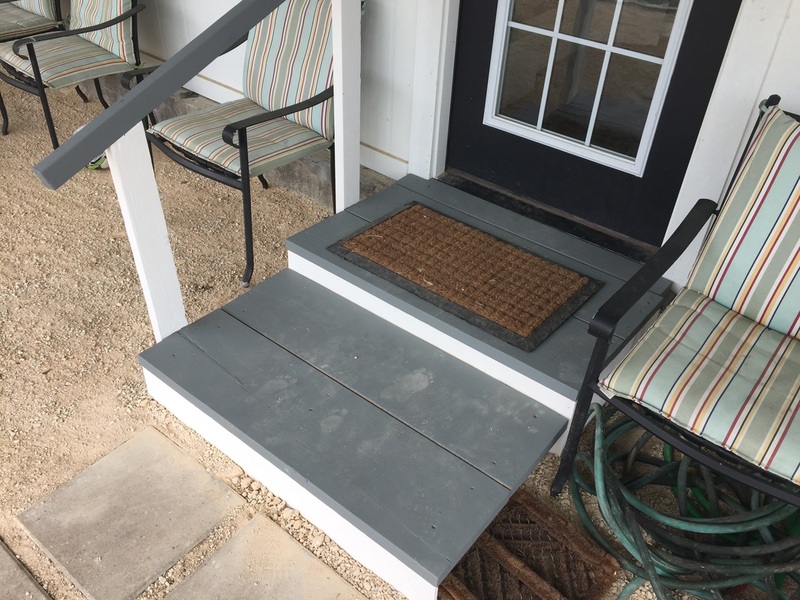 However, my father-in-law has a hard time with stairs, and getting his walker up the "paver stair" was challenging, to say the least. So my sweet daddy build these steps and a nice sturdy railing. However, it looked like dirty wood for 4 months. I finally got around to painting it and it looks so much better. 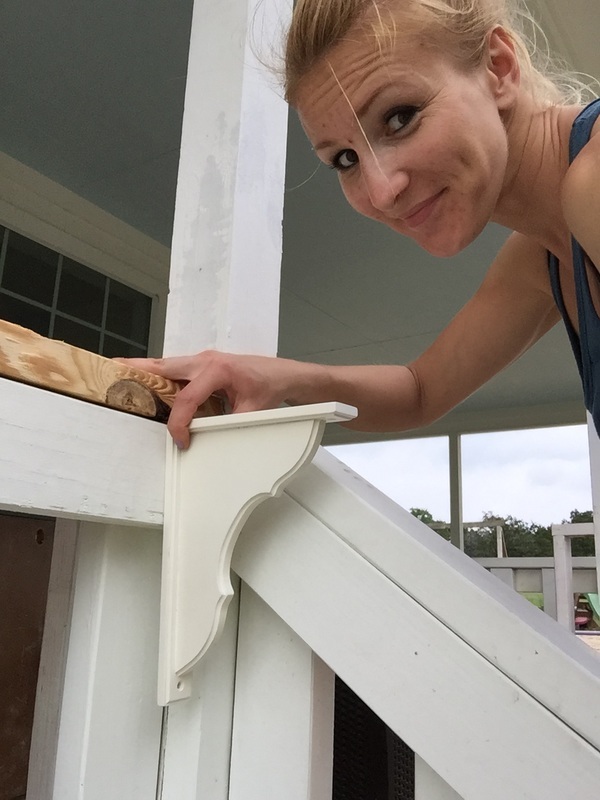 Rustoleum Deck Restore 4x in Granite, on Rhyne Farm back porch stairs. I used Rustoleum Deck Restore 4x in Granite. I'm a huge fan of this product... for now. We'll see how it holds up to 4 kids in Texas Hill Country. But I love how it turned out. 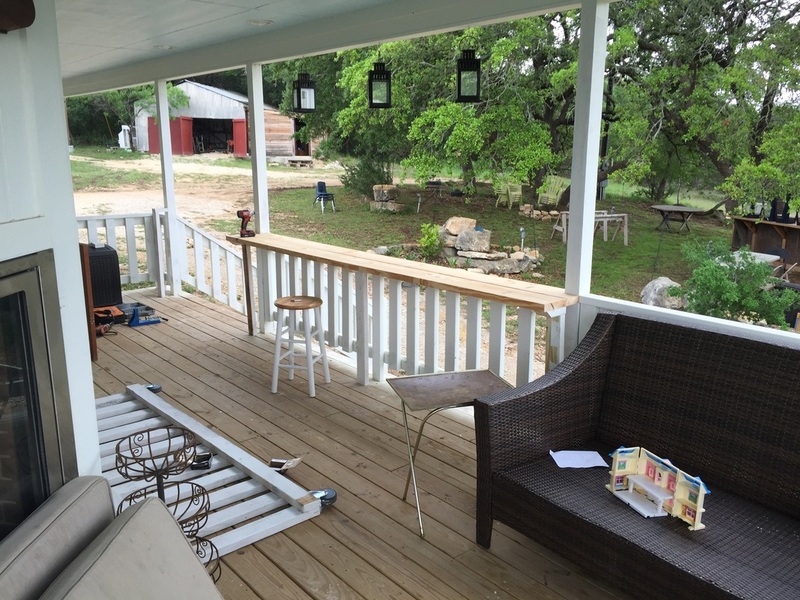 We plan on painting our whole front porch deck in the same color. Maybe I should have cleaned up a little bit before I took the picture, maybe moved the hose, or cleaned off those dirty little footprints.... Nope! This is real life. I need that hose and I CHERISH those little footprints. My babies are such a blessing. I can't imagine my life without their messes and smiling faces. One project down, a million more to go. I hope y'all are having a blessed week, I know I am. Hubby just came home from a business conference in Vegas, so I am happy to have him home... usually, hehe! Come on now, he works from home, I'm just being honest. Y'all come on back now, ya hear! 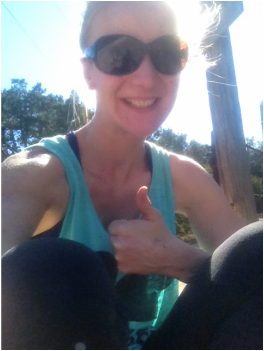 I haven't blogged in 2.5 years, YIKES! See my last post here! We have been so busy, remodeling the Seattle house, selling it, and packing up and moving to Texas. Life has been a complete whirlwind. Well, to sum it up, back in 2010, we moved into a tiny 920 sq ft cottage house built in 1916. It was old and so gross. We had 3 children at the time, Carter was 4, August was 2, and Luella was 6 months old. Magnolia was born 1 year later. Four children in such a tiny house in a city that didn't stop raining was quite a challenge. 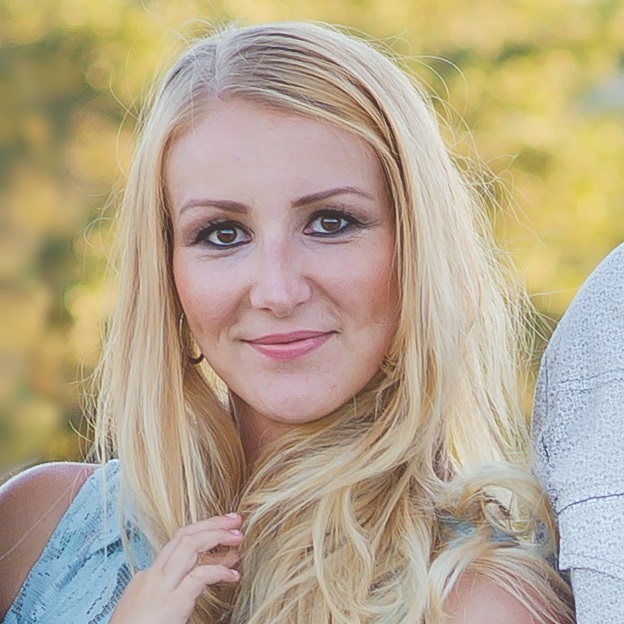 Add a never-ending remodeling disaster to the mix, and a husband building a web app company from home, it was nuts. It took us 3 years to get the place in tip top shape and sold in 3 days with a multiple offer bidding war. It was great but crazy. We had to pack our whole house into a moving POD, to be shipped to a storage facility in Texas, and we packed up our minivan with clothes for 2 weeks and headed to Texas, plans for the first 2 weeks in Texas, but no clue after that. 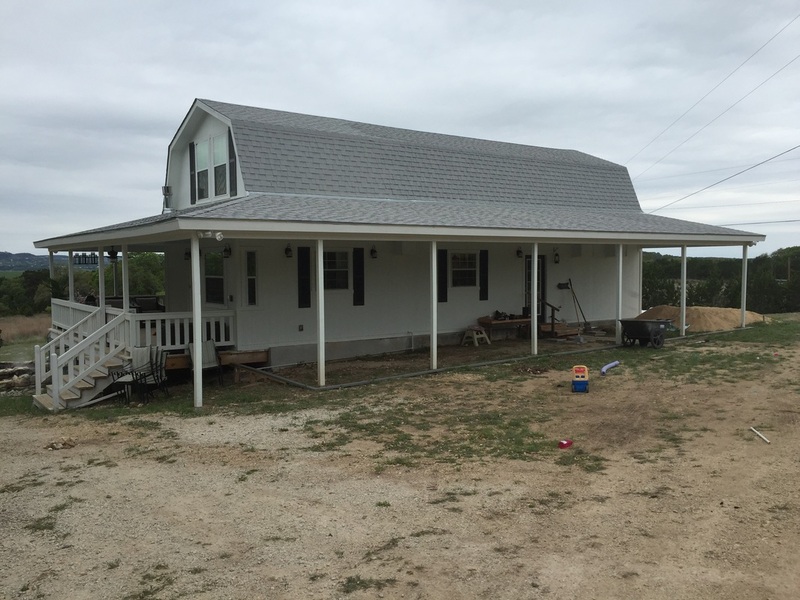 We found the most gorgeous piece of land, 14 acres, small cottage, 2 huge barns, and a little guest house and made an offer 5 days after stepping foot in Texas. It took us 6 months to close with the bank because it was such a unique property, half finished cottage, and multi-residence, (I'll talk more about that later), but it was so worth it. I designed an addition for the house, we found a builder, who turned the cottage into a real home (blog more on that process later too)... but we are back in the blogging atmosphere. We have 29 chickens, a fully furnished 3 bedroom guest house, an outdoor kitchen/ bbq, and are hoping to get a garden going soon. In the meantime, here are the listing pictures from the old house. I will always love that house, especially that kitchen. I'll talk more about our actual move, living in a 2 bedroom apartment with 8 people for 6 months, the struggle with the banks to finance our dream, living in the guest house, building the dream, and everything else that we've been up to! I'm so glad you came to visit. I hope you can really come to visit us soon! (See our guest house here) We'd love to have you! If you are going to be dreaming anyway, DREAM big! My name is Melissa. We moved from Seattle to Texas to build the farm of our dreams. 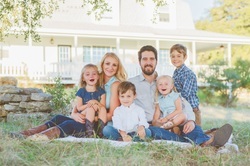 I love to build, design, and raise my 4 beautiful children.